Its been a long season, but what a season. Back at the beginning of September Bleddyn Phillips and Justin Burnell laid out their plans for the coming season, they announced they were united in one aim, and that was a return to the Premiership. Well ten months later we see the successful completion of those plans and London Welsh are back. So what happened along the way? It all started back in September with a double header that wasn't to everyone's taste, against old rivals Bedford at Allianz Park, with crowd numbers emphasising just how far Championship rugby has to go with regards to its recognition within the game. However that didn't matter to the team, who Justin was already praising for their hard work and spirit in training, something he would go on to do over and over again all season emphasising just how hard everyone was working towards our common goal. That first game was one of mixed results and emotions. whilst Welsh won the game fairly comfortably and demonstrated how their forwards were going to be vital to their whole campaign, they also picked up their first or two Red cards last season, after only 32 minutes when Rob Andrew was sent from the field after tempers frayed for a second time. Earlier though with just 11 minutes on the clock Will Robinson crossed the white wash for London Welsh's first score of the season. Just 5 minutes later Gordon Ross, despite missing two previous kicks slotted over his first of what was going to become a near record breaking string of successful kicks. Despite a 23-14 score line Welsh never really looked in trouble during the first game of the season. Next game saw us completely dominate Nottingham, who despite making last season's play-offs were going to find themselves languishing near to the bottom of the table, helped on by Gordon's successful run continuing with another 10 successful place kicks and 4 tries to record our first 5 point win of the season. It wasn't until the third game of the season against Plymouth, when Welsh finally played at home in front of a disappointing crowd which only made it to one short of a thousand. However on the pitch the pack continued to dominate, resulting in another bonus point win and a further 8 successful kicks from Gordon, who by now had slotted over twenty place kicks without a miss. the 4 try haul saw the final score 40-9. Next to come was the long trip to Rotherham, where both teams were putting their 100% records on the line. The game started briskly with four tries within the first 12 minutes, unfortunately three of those going to the home side, with ex Titan Carl Kirwin adding one for Welsh, thankfully Gordon's kicking stayed steady and Welsh were lucky to still be in touch 20-16 at half time. Despite some stout defending by Rotherham, London Welsh showed for the first time their refusal to be beaten and their confidence to stick to the game plan knowing the game would come to them later. something which was to prove pivotal to the whole season many months later, come the play-offs. Thanks to some gritty play and six of the best from Gordon London Welsh managed to sneak across the winning line by a margin of 27-32 in their favour. Next saw a two break for the British and Irish cup where we hosted our oldest rivals London Scottish at Newbury's Monks Lane. The afternoon saw Scottish run out 32-26 winners, but that was seen on the back of a complete squad rotation with Justin Burnell taking the chance to give some of the less senior and new recruits some game time. The following week saw another B and I defeat against eventual semi-finalists Pontypridd, Justin Burnells, home town and former club, disappointingly for him an almost full strength London Welsh were pipped by Ponty who played their hearts out to ensure that Justin would have to wait until the corresponding fixture at the Kassam, to restore bragging rights. Next came many people's pre season favourites to make the play-offs, Cornish Pirates, but welsh put them away in fine style with 5 tries in a convincing 41-6 win despite some stern defending by the away side, Ross added another seven to his tally which left him on a run of thirty three kicks since his last miss. A tally that went all the way back to the first game of the season. London Welsh had to once again come from behind late in the game against Leeds, showing both grit and confidence in their game plan, but on the downside, Gordon Ross missed two kicks his first in 6 games, whilst just three short of a new championship record, in a game which saw him hand the kicking tee over to Alex Davies, from whom he wouldn't get it back until Alex himself would be forced out due to injury. Next a close run, but uplifting win against many people's favourites for promotion, Bristol, in which London Welsh came out the victors, through stout defence and a cast iron will to impose themselves over their opposition. Following on from that came two fairly easy wins against Ealing and Moseley, who put on a fantastic club house experience having brought in the Tredegar Orpheus choir for the day, something that would result in everyone refusing to get back onto the bus at the allotted time, well that combined with the fact that it was also ex London Welsh captain, Mike Powell's birthday, who now plays for Moseley.An eventful day which saw kick off delayed due to the fact that most of the London Welsh Players had to drive themselves , due to the non-arrival of the club bus. What was happening now though, the following week saw a dramatic loss away to Bedford with a try apiece in injury time at the end of the game, with Alex Davies unable to slot over the extras that would have seen us sharing the spoils. Following on from a double header in the British and Irish against Edinburgh Academical, where London Welsh ran out 106=17 winners over the two legs it was back to The Kassam, where horror of horror Welsh suffered a second successive league defeat, this time at the hands of our oldest rivals London Scottish. With no Christmas game this year the long awaited trip to Jersey signified the halfway point in the season and after two losses Welsh were keen to re-establish themselves back into winning ways, which they did, despite making heavy weather of beating a well organised Jersey defence. The following two weeks in the B and I saw some pride and bragging rights restored with wins over Pontypridd and London Scottish, but it was a case of too little too late and it was Ponty who progressed through to the knockout stages. Next came Leeds at the Kassam in what even at the time looked like it might be a dressed rehearsal of things to come, once again Leeds who at this point were themselves on a strong unbeaten run, but up stern opposition, but Welsh managed to sneak a 9 point win to maintain their place at the top of the table. But that was to be short lived after Welsh saw close rivals Rotherham take top spot after beating Moseley and unbelievably were themselves dealt their biggest defeat of the season away to league strugglers Plymouth. The Dragon was for the first time this season knocked off of its perch and some of the less optimistic were fearing a second half of the season slide in form and as if to silence the critics Welsh roared back to the top with what can only be described as a seven try demolition of closest rivals Rotherham. In Welsh's previous promotion season the game against Rotherham at a similar time in the season was commonly regarded as the turning point in the season, and maybe so it was to prove once more. Many still herald that game as Welsh's most complete 80 minute performance last season and it's easy to see why, Rotherham were under pressure from the first to the last minutes, with Welsh scoring their first try after only four minutes and their last as late as the 78th, to run out 47-16 winners. The much awaited trip down to Penzance, turned out to be a non event. The previous week saw some of the worst storms in decades batter the country with the main train line into Cornwall washed away at Dawlish and despite battling for 16 hours a band of loyal followers were left disappointed, when the match was called off on the morning before the game. Though hardly surprising considering the devastation in Penzance. The following week saw a friendly against our nearby friends Blackheath, where some of our players had been going to get game time and rehabilitation after coming back from injury. Our next foray in the league was St David's day against Ealing and following more heavy rain the game was announced on, despite all of those who had made the trip to Cornwall declaring that the pitch was in far worse condition than at the Mennaye two weeks previous. The game went as expected with Welsh running out 39-6 winners, but Ealing were starting to show glimpses of the form that would see them so close to staying in the championship. The real winners though that day were the fans who attended the superb Dewi Sant dinner, laid on by our hosts, who really looked after us well that day. Our next game was at where many still consider home, Old Deer Park, where we hosted Moseley as part of the celebration day for the 6 Nations clash against England, which was taking place down the road at Twickenham, the game saw a thorough overhauling of the visitors as Welsh ran out 42-18 winners. unfortunately Wales couldn't manage the same against their opponents but even that couldn't dampen the party spirit as many partied on until late into the night. The next game was the re-scheduled game against the Pirates, which saw Steve Price , the loan Welsh representative witness a 20 point to 5 win which signaled the end of a 3 match bonus point winning streak, however Welsh were still sitting pretty in second place in the league. The business end of the season was fast approaching and it was important to keep concentration which Welsh did with successive revenge wins over Bedford and London Scottish and capped off with a play-off guaranteeing thrashing of Jersey, who were having their own bottom of the table fight, with a resurgent Ealing Trailfinders. The next game can only be described as a tense grudge match, which despite having nothing riding on it, many saw as significant, not only for bragging rights but also for team confidence and morale. Welsh were lined up against who many considered our only real rivals for promotion, Bristol. Well amidst a great atmosphere , amongst an 8000 strong crowd, and despite being put under immense pressure Welsh managed to go in at half time amazingly only five points to nil down. Well the quarter after half time had on many occasions been our weak point and so it was to prove again with Toby L'Estrange breaking his leg only three minutes after the interval, an injury that would portend a further string to crucial players. Following that came a spell where Welsh were taken apart with Bristol scoring three tries in a 10 minute period, leaving Welsh seemingly down and out with only 10 minutes on the clock and trailing 22 to nil. What happened in the next 10 minutes epitomised London Welsh's team spirit, drive and never say die attitude that had and would again have a monumental affect on our season. Welsh came roaring back with three converted tries of their own, to narrowly miss out 25-21. more importantly though it gave the players back the confidence to know they could get at Bristol should they meet later down the road. The final game of the regular season was hosted again at Old Deer Park due to a fixture clash with our co-tenants at the Kassam, Oxford United, where Welsh played open flowing rugby against a Nottingham side who had struggled to find the form of last season, and this game was no exception with Welsh running out healthy 64-12 winners, to bring a close to the regular season. Justin and the team had so far held good on their promises and had reached the play-offs, it was now one game at a time to see how far they could go. The players were given a well deserved week off and the fans had to wait two weeks before the first of the semi-final legs against Leeds and maybe the nerves built up over the extended lay-off as we were severely tested by a very strong and well drilled Leeds team, who certainly weren't planning on just making up the numbers. Leeds came out hard from the start with their big forwards and won penalty after penalty against an ill disciplined Welsh side however Welsh dug deep and hung in there with the difference being a superb perfect kicking display by Leeds fly half Glynn Hughes who hit 9 out of 9 leaving Welsh feeling lucky to get away only being a score behind at 38-31 at the half-way point in the tie, but with the big loss of Alex davies to a torn crutiate ligament. The following week saw Welsh host Leeds at the Kassam and once again Leeds came out hard at the home side, again breaking from deep down the middle. The game swung one way and then the other with Welsh making a pretty good start and at one point with 20 minutes to go and the score at 14-7 Welsh had the cushion they needed to go through courtesy of the tries scored rule. but Leeds again came storming back and with 13 minutes to go Welsh found themselves as many points behind on aggregate score when Leeds crossed for a converted try..
What happened next can only be compared to Lazarus rising from the dead as once again this season, Welsh dug deep, called on all their resources , experience, concentration and team spirit and set about a mini demolition of Leeds scoring two tries themselves along with a conversion and a final Gordon Ross, penalty to nick the tie with an aggregate score of 60-58. 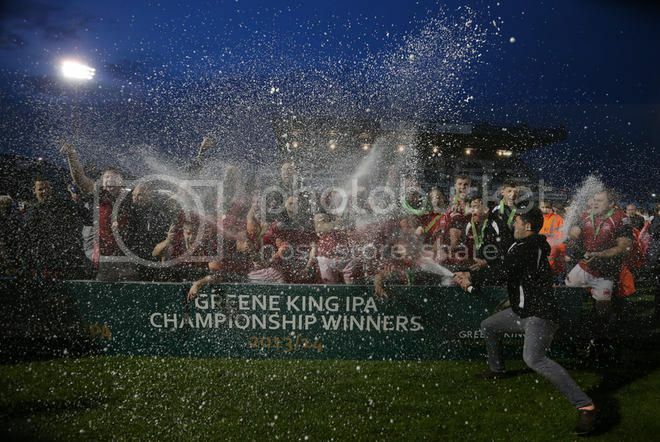 With the final first leg 10 days later a wet Wednesday evening greeted both the home fans and a large travelling Bristol support and what happened that night considering the added pressure, probably ranks as Welsh's best performance of the season. Bristol opened their account early with a try on 4 minutes and many were thinking they were about to experience a déjà vu of the last meeting of the teams. After a cagey 20 minute spell with Welsh having to soak up a lot of pressure and defend well, London Welsh started to find their feet and so began a systematic dismantling of the self-confessed best team in the league. The Bristol teams heads dropped and their fans fell silent as Welsh ran in three converted tries of their own, with Ross really having found his kicking boots again. The score could have been maybe a t least another 10 points higher with some better handling on the try line and with Bristol securing a last minute penalty to leave the Kassam 19 points adrift. A Week later saw everyone down at the "Mem" to see Bristol host their last ever game there before moving to Ashton Gate. Bristol came out strongly against Welsh but Welsh defended equally strongly and with Nicky Robinson having left his kicking boots at home again and Welsh playing quite conservatively, it wasn't until 28 minute before the deadlock was broken by a rare Gordon Ross drop goal. Bristol did come back with a try of their own and at half time had a slender lead 8 points to 6 leaving them still 17 points adrift of the required aggregate score. Bristol did fight back strongly opening up a 20-9 lead at one point, but still not quite enough for overall victory. Then came the icing on the cake when in a five minute spell Welsh crossed the whitewash twice with Ross converting one to give the Exiles victory on the night and an overall aggregate win of 48-28 to spoil Bristol's party on all counts and send Welsh into raptures of delight. Edited 1 time(s). Last edit at 2014:07:23:19:52:08 by chappers. nice one, thanks for all your efforts on here this season!